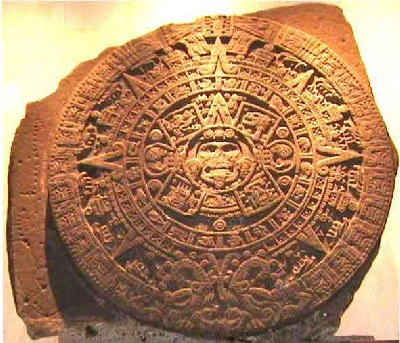 "...IN TICCHICAHUAH HUEHUE TLAHTOLLI, HUEL XICCAQUICAN, XICANACAN , IN ANTEPILHUAN, IN ANTEIXHUIHUAN, IN ANMEXICAH, IN ANTENOCHCAH IHUAN MOCHINTIN IN ZAZO AC YEHUANTIN IN AMOTECH QUIZATIHUI IN YOLLIZQUE, IN NEMITIHUI IN AMOTLACAMECAYOHUAN YEZQUE..."
(F. Alvarado Tezozomoc, "Crónica Mexicayotl").
" ...TICMATIH TOTLATQUI TOPAN YUHQUIN HUEY CHALCHIHUITL.....MACAHMO QUIILCAHUACAN, MA QUINNONOTZACAN INPILHUAN HUEL QUENIN MOYETZINOTIYEZ IN IMACOQUIZALIZ, QUENIN OCCEPPA MOEHUALTIZ TOTONALTZIN IHUAN HUEL QUENIN QUITZONTILIZ HUEYICA INEHTOLTILIZ ININ TOTLAZOHTLALNANTZIN ANAHUAC..."
(Mihtoa, tlatzaccan Cuauhtemoctzin itenahuatil, tonalli matlactli omei cuetzpallin, xihuitl yei calli).
" ...HUEY ALTEPETL TOLLAN...ONCAN OTLAHTOCAT...IN HUEY TLAHTOANI IN QUITOCAYOTIAYA TOPILTZIN ACXITL QUETZALCOATL. NOHUIYAMPA TLAMAMAUHTIAYA...INIC TLACAMACHOYA....MOTEUHCZOMATZIN IN ICTEOMECA IN YUHQUI INTOCA IN QUIHTOAYA: ' CA ZAN TITENIENTEHUAN; IPAL IN TITLAHTOCATIH, HUEL NAHUALLI CATCA, YEHUATL ITLANEXTIL IN NAHUALLOTL'....."
(Domingo Chimalpáhin, Colhuacan itetlalnamictiloni / "Memorial de Colhuacan"). IN ATL XOXOUHQUI IMANCAN. IN IZTAC TOLLIN IMANCAN. IN IZTAC ACATL IMANCAN. IN IZTAC HUEXOTL IHICACAN. IN IZTAC AXALLI IMANCAN. IN TLAPAPALICHCATL YYONOCAN. IN TLAPAPALATLACUEZONAN YYONOCAN. IN NAHUALLACHTLI YYONOCAN. IN ZACUANMIZTLI IMANCAN.
" ...NICAN NIC HUAL HUICAC NONAHUALTEZCAUH IN IXCEHUALPOPOCATIMANI, IHUAN NIQUIN ON HUICA IN MACUILTONALLEQUE, CEMILHUALEQUE QUIMONTZACUHTIAQUE IN MOTLAHUAN TLAMACAZQUE TLILPOTONQUE....."
(Cuicatl ipampa Tezcatlipoca, oquitlacentlalic Hernando Ruiz de Alarcón). TLAMACAZQUI IHUAN TEYACANQUI IN MEXITIN, IN IHCUAC, ACALTICA, OHUALLAMACEHUAYA, QUIHUALTEMAYA IN ACXOYATL IN OMPA COLHUACAN CHICOMOZTOC.
" ...IN CEPPA HUALHUI IN QUIHUALITTACA CECENMANTOC IN ACXOYATL, IN AQUIN QUIHUALCECENMANA. 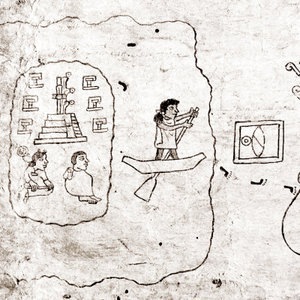 NIMAN IC ONCAN QUIHTO IN MEXI, IN CHALCHIUHTLATONAC: 'TOCNIHUANÉ' QUIMILHUI IN MEXICA 'MA YEH IC OTIHUALLAQUE, MA YEH IC OTIHUALQUIZQUE IN TOCHAN AZTLAN'.........."
ACHTO YEYANTLI IN MEXITIN. QUIHTOZNEQUI: "AAZTAPILCAN". ITLATLIANALIZ NETECHANTICA 'ATL' IHUAN 'AZTAPILLI'; IN IPAMPA, AAZTLAN QUIHTOZNEQUI "AAZTAPILCAN" AUH IN YUH "IZTAC-YOCAN".